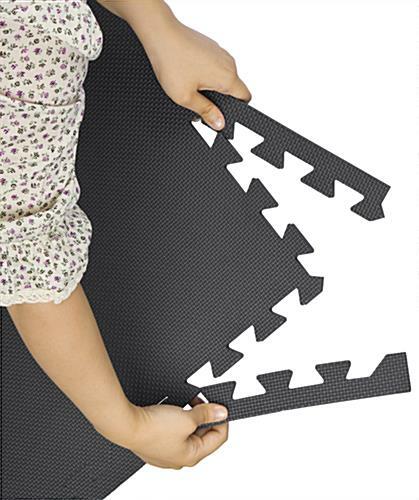 Anti-fatigue tiles provide a comfortable surface to walk and stand on. 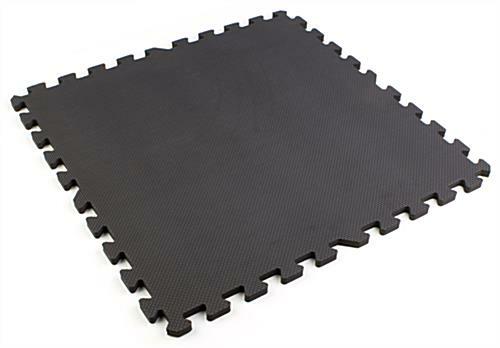 Durable black finish foam mat to be used in any environment. 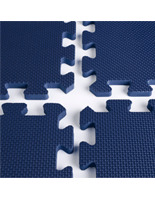 Interlocking tiles are ideal for quick and easy set up. 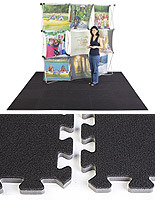 This tradeshow flooring, like floor mats and exhibit flooring, is reliable and extremely durable. 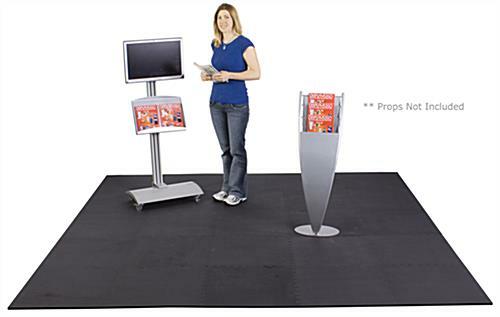 Made from EVA (Ethylene Vinyl Acetate), this tradeshow flooring is water and oil resistant and can be easily cleaned. 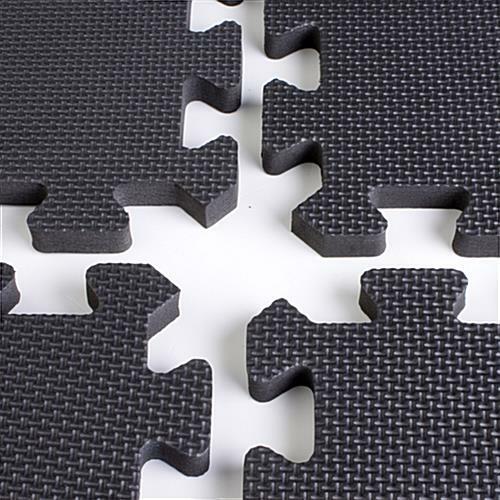 This tradeshow flooring, also known as floor mats, provides a comfortable surface for staff members and customers to walk on, as the tiles are anti-fatigue and shock absorbent. 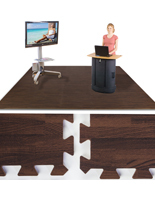 With this tradeshow flooring, your staff can stand all day long without hurting their feet. 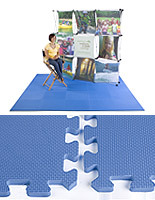 The tradeshow flooring, such as the floor mats or exhibit flooring, forms a 10' x 10' floor surface. The finished edges of this tradeshow flooring will look professional and attractive. 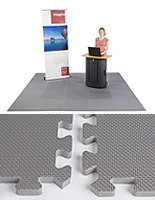 This tradeshow flooring is great for use in trade shows, exhibition halls, conventions and show room areas. 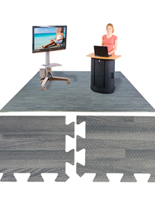 Tradeshow flooring can be easily connected with the interlocking tiles. We sell tradeshow flooring in many different colors and materials as well. 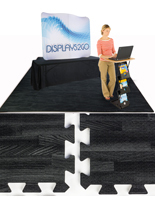 Add tradeshow flooring to your tradeshow booth today for a professional appearance. These are wonderful! We do a lot of craft shows and standing on concrete or linoleum is extremely hard on my back. These make standing SO much more comfortable and I can stand longer! 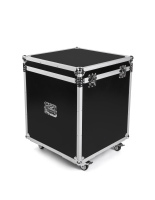 I ordered them New Year's Eve needing them by January 4 for a show and I hoped they would arrive in time. I did not use expedited shipping and to my surprise they arrived on January 4, before we left to set up for the show! What a miracle! Thank you Displays2Go fir shipping them out so quickly! Keep selling wonderful products! If I need anything else, I will look here first! Thank you so much for the wonderful review! We are so happy to hear that our foam mats are making it much more comfortable for you to stand at craft shows, and we're glad that we could make a New Year's Miracle happen for you :) We hope you'll come to us when you need displays for your next show — we have plenty! 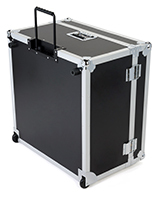 Shipped in a timely manner, easy to set up and break down, provided much needed relief for tired feet at an expo.